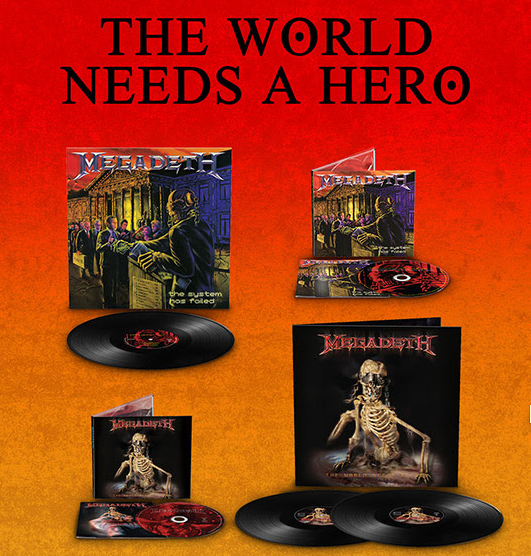 MEGADETH‘s ninth studio album, The World Needs a Hero was originally released in May 2001 and was critically acclaimed as a return to a heavier musical direction for the band. It charted at No. 16 on the Billboard 200 and received positive reviews across the music press. * Includes rare live bonus track “Coming Home” on the CD and digital versions. MEGADETH‘s tenth studio album, The System Has Failed was originally released in September 2004. Following the direction set by its predecessor, The World Needs A Hero, it headed further into the bands thrashier past and was a hit amongst fans and critics alike. Debuting at No. 18 on the Billboard chart, the album received positive reviews across the board stating it as vital and solid. * Includes rare live bonus tracks “Time/Use the Man“ and “The Conjuring“ on the CD and digital versions. This entry was posted on December 22, 2018 at 11:46 am and is filed under Heavy Metal, Metal, metal music, Music, music news, news, rock music, world news with tags dave mustaine, Heavy Metal, megadeth, metal albums 2019, Metal News, metal odyssey, Thrash Metal. You can follow any responses to this entry through the RSS 2.0 feed. You can leave a response, or trackback from your own site.